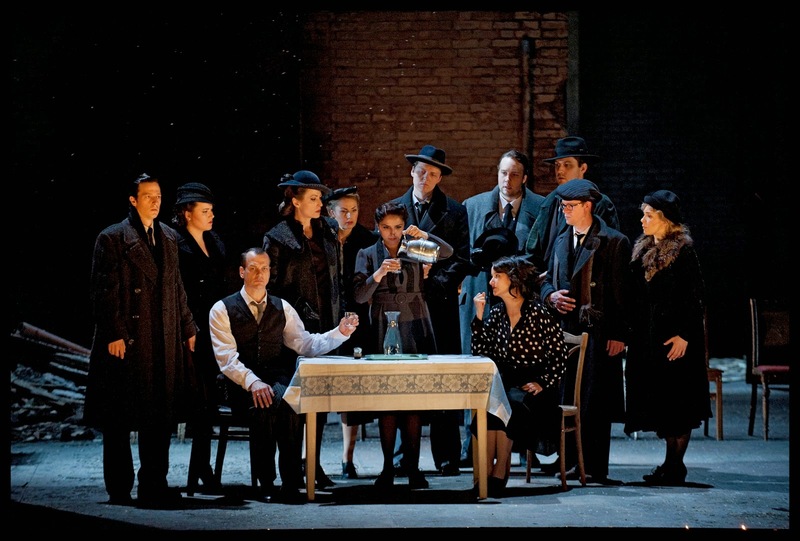 D: Robert Lepage; with: Adrian Eröd, Audrey Luna, Stephanie Houtzeel, David Daniels). 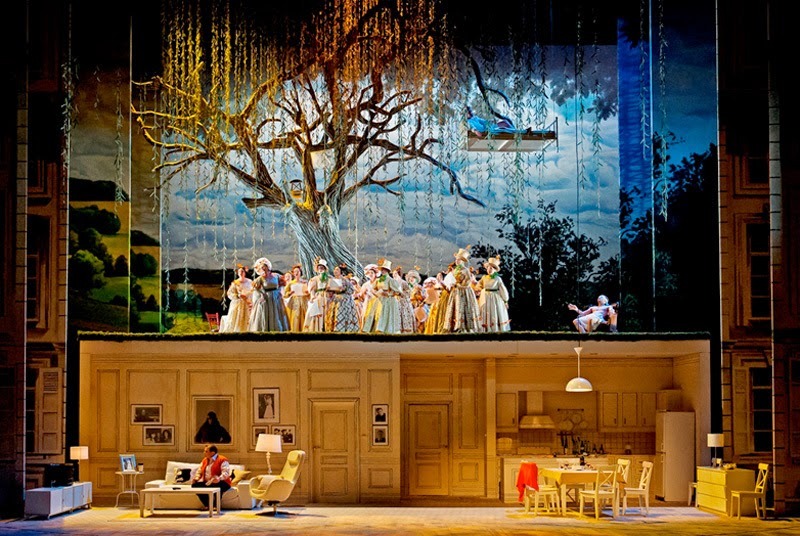 children’s opera tent (18 April 2015 - C: Johannes Wildner; D: Alexander Medem). The new season will also see the débuts of many artists, such as the conductors Thomas Adès, Tomáš Netopil, Yannick Nézet-Séguin and the directors of all six new productions: Kasper Holten, Lev Dodin, Pierre Audi, Uwe Eric Laufenberg, Irina Brook and Robert Lepage. 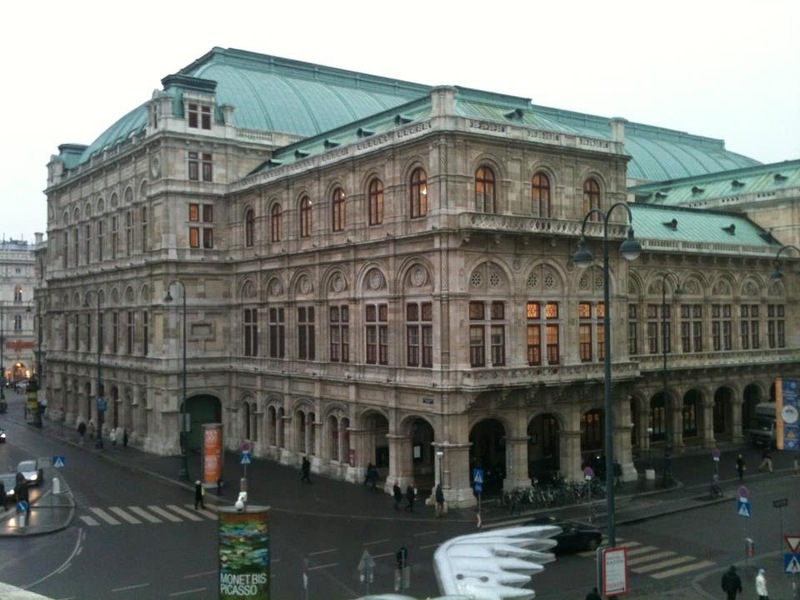 The singers who will be performing for audiences at the Wiener Staatsoper for the first time in 2014/2015 will include Maria Bengtsson, Alice Coote, Elizabeth DeShong, Aida Garifullina, Kathryn Lewek, Audrey Luna, Erin Morley, Ekaterina Semenchuk, Carole Wilson, Wolfgang Ablinger-Sperrhacke, Andreas Conrad, David Daniels, Ryan Speedo Green, David Pershall, Mikhail Petrenko, and Dmytro Popov. Other attractions include Simon Rattle conducting the Ring, La Juive, Cardillac, The Cunning Little Vixen, Peter Mattei in the title role of Eugene Onegin, Christian Thielemann conducting Ariadne auf Naxos, and Kyrill Petrenko conducting Der Rosenkavalier. Daniele Gatti had not conducted the LSO since 1996, so it was more than time to put that right. The orchestra has not always recently had the happiest of times with Mahler: nothing to do with the orchestra itself, everything to do with largely uncomprehending conducting by Valery Gergiev. This concert, however, made it clear that the LSO remains a Mahler orchestra to be reckoned with. Gatti, whose Philharmonia Mahler Fifth in 2012 was the finest performance I have heard ‘live’ of a work that often proves problematical in performance, turned his hand with excellent results to its still more problematical sibling. The first movement opened and in general – but not always – proceeded in deliberate fashion: not quite Klemperer, but with some of his doggedness, if not his plain-spokenness. If I say that its great span seemed longer than usual – and I suspect that it was – I do not mean to imply that such length was an impediment, far from it. But rather this was a reading whose weight entailed effort; it was quite rightly not a journey to be embarked upon, or indeed to be continued, at all lightly. For what it is worth, a performance that began at 7.35 finished at about 9.05. Sitting considerably farther forward than I usually do, indeed farther forward than is probably ideal, with only two rows between me and the stage, the orchestral effort was revealed to me in more than usually physical fashion. But as so often, there are compensations: for the losses in blend, there were gains in well-nigh overpowering immediacy – and, at times, sheer volume too. In a performance which set the scene for the rest of the symphony, Gatti did not take Daniel Barenboim’s path, which to my initial surprise, has turned out to work extraordinarily well both live and on CD, of transforming Mahler’s symphony into something more akin to Brahms, in other words of forcing the material to make sense. Instead, Gatti revelled in Mahler’s discontinuities; this was, one might say, whether consciously or otherwise, a veritably Adornian reading. Lest I be misunderstood, I do not mean something merely chaotic; there has, in a sense, to be an overall line posited before discontinuity can assert itself in positive fashion. That there most certainly was, and that it most certainly did, the LSO’s virtuosity enabling it to follow him and to lead us. Moreover, the echoes of the Sixth Symphony resounded perhaps more strongly than ever I have previously heard: partly, I think, a result of the deliberate tempo, partly a result of the almost superhuman effort with which the strings dug into their instruments, and partly a result of a sure harmonic understanding which guided the discontinuous progress almost as a parody of the earlier work: a parody which wanted to match, which was doomed to fail, and which yet in that failure revealed something different. The three inner movements were rightly taken as parts of a greater whole. Here the full garishness, horror, and sweetness of nightmares whose truth we never quite come to believe in were properly revealed, as much through orchestral colour as command of line and rubato. Wherever we were led, there was no doubt that this was the intention. 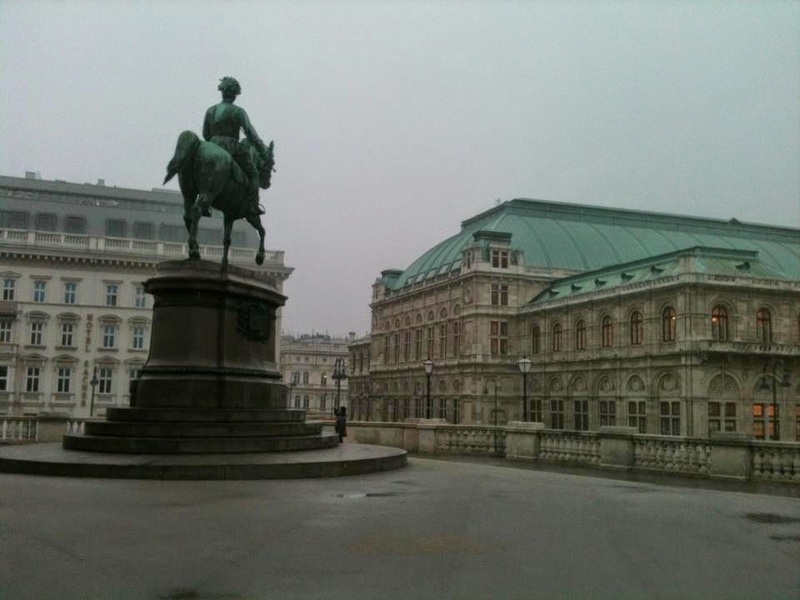 Rhythms recalled old Vienna – or should that, at least in Mahler’s case, be new Vienna? – and the parade ground. Mahler’s scoring registered with the greatest sensitivity: I can rarely have heard the mandolin so clearly and with such Don Giovanni-like subversion, and the cowbells sounded miraculously from the distance with an atmospheric perfection I should have thought quite beyond the Barbican’s acoustic. If night fell with relative – and this is certainly only relative – normality at the opening of the first Nachtmusik, and all manner of deathly creatures haunted the scherzo, the disturbing charms of the second Nachtmusik beguiled, seduced, and, in context, unsettled at least as much as what had gone before. With this symphony, and in this performance, nothing was ever quite what it seemed – but consciously, or perhaps sub-consciously so. The Meistersinger echoes of the finale tried, as they would, to wake us from the nightmare, but that nightmare or those nightmares perhaps proved all the more difficult to dispel on account of their ambiguities. When Bernstein, for instance, in his magnificent but very different final recording, lets loose the spirits of Hell, one feels that that is just what they are. Here, the daemons were unclear, and we were unclear who or what they were – which is perhaps why they never really left the stage at all. The end was properly inconclusive; Mahler’s symphony had been made strange once more. A celebration in style for the Arditti Quartet: no fewer than three concerts throughout the day. I had hoped to attend all three, but in the event had to settle for just the evening concert, which boasted one of three world premieres, the others having been the third quartets of James Clarke and Hilda Paredes (Bitácora capilar). I also missed hearing works by Jonathan Harvey, Carter, Kurtág, Lachenmann, Hèctor Parra, Georg Friedrich Haas, and Ligeti. Still, what I heard offered a Birtwistle premiere, and works by Wolfgang Rihm, Tosho Hosokawa, Brian Ferneyhough, Pascal Dusapin, and Xenakis, so there remained plenty to fascinate to thrill, and yes, to beguile. A quartet which, since its first concert in 1974, has performed and recorded hundreds of new works, many of them Arditti commissions, has an extraordinary amount to celebrate looking back, of which this could only be a tiny fraction, but also still to anticipate, hence the premieres. The concert I heard was typically excellent, no fewer than six works granted advocacy as impressive as conceivable, indeed arguably more impressive than conceivable. Rihm’s Fetzen (‘Scraps’) offered a wonderful ‘overture’, in many ways more individual than much of the composer’s music I have heard. The first is almost a mini-concerto, the first violin’s part more than first among equals; it put me in mind of Berg’s Concerto more than once, and indeed, much of the language of both seems recognisably post-Schoenbergian, the ‘Peripeteia’ of op.16 also coming to mind (despite the obvious differences in colour!) Repeated blows of demarcation bring the short movement to a close. Following a strikingly frenetic second violin opening, the second piece has the material taken up by the other instruments of the quartet; ‘mechanism’ at times seems somewhat Stravinskian, certainly quite a contrast with Fetzen I. The closing chorale, anything but triumphant, provides a fragile, even ghostly conclusion, the players’ hush not the least of this performance’s qualities. Birtwistle’s Hoquetus Irvineus, dedicated to ‘Irvine and his lovely boys’, proved a winning pièce d’occasion with which to open the second half. The syncopations of hocket and something not so very far from post-Stravinskian swing offered an experience that both drew one in as a listener and was also, quite simply, good fun. Grinding of typical Birtwistle mechanisms propelled the music along, leaving one satisfied yet wanting more. ‘Ah yes, said Carnier, lente, lente, and circumspection, with deviations to right and left and sudden reversals of course.’ With those words from Beckett’s Mercier et Carnier, Dusapin begins the score of his fifth quartet. That ‘lente’ is certainly characteristic, though this is not a slowness that tires. The opening, high-lying first violin lyricism, accompanied by pizzicato from the others, certainly offered time to enjoy the view, whatever that may be, in properly Beckett-like fashion uncertain as to the destination, which may not even have existed. Quiet yet incessant chatter – late inheritance of Xenakis’s swarms? – offers quite another experience, prior to the relative resolution of the close. Finally, Xenakis’s Tetras. From first violin to second violin to the quartet as a whole, the ‘uncompromising’ – perhaps a cliché by now, but surely apt in this case – opening proved characteristic of work and performance as a whole. The combination of novelty and familiarity to scales and arpeggios suggest a parallel, maybe alien world: more so, arguably, than the frankly extra-terrestrial ambitions of Stockhausen. One passage sounded as if it might have been musique concrète; I had to check that I was indeed listening to a string quartet. This final performance offered the commanding virtuosity of what, for this ensemble, has become a repertory piece. Silence at the close had no need to be enforced; it was the only possible reaction. Premiered in May last year, Katie Mitchell’s production of Frank Martin’s oratorio, Le Vin herbé, is now revived in fine form by the Berlin State Opera. Mitchell’s tendency towards one-size-fits-all suits some works better than others, but is in any case more restrained here. One perhaps also has greater liberty – or at least greater immunity from werktreu charges of desecration – in staging an oratorio anyway. Interestingly, the first staging took place as early as 1948, at the Salzburg Festival under Ferenc Fricsay, no less, only six years after the Zurich Madrigal Choir gave the first performance of the completed version (the first part having been performed by the same choir two years earlier than that). Mitchell’s approach is metatheatrical, as one would expect, but without the paraphernalia of cameras and so forth; rather, we see a dramatisation of, if not the first performance, then a performance recognisably of that time. Rituals create themselves, gain impetus, both from the performers’ behaviour and the props provided: notably a table and a bed. There is more than a scent of Brecht: no bad thing, especially in Berlin. Clearly the performers have been well-choreographed, but they also give the impression of being those performers performing, not just of doing what they have been told. It is a fine production, which other companies and venues would do well to consider taking up. ENO or the Barbican perhaps? The work itself is alluring, typical of what I know of the composer in its epitomising Webern’s summarising twelve-note composition as involving imbibing of the method and then composing as before. Frankly tonal, and yet so clearly, so rigorously organised, its roots lie as much in, say, Pelléas as Tristan, despite the use on occasion of quotation and the inevitable comparisons any composer, or indeed artist, will now meet when daring to treat with this legend. Yes, it comes from Joseph Bédier’s novel, Tristan et Iseut, but facts are no refuge from the overpowering Rausch of Tristan; it is to Martin’s great credit that he is not overpowered, far from it, without self-conscious distancing. Much of Tristan is, of course, chamber music, whatever ‘popular opinion’ will tell you; here, the ensemble is of true chamber proportions: twelve voices, two violins, two violas, two cellos, double bass, and piano. Some of that Second Viennese School sound arises – I could not help but think of Schoenberg’s wonderful Weihnachtssmusik – but that more betokens correspondence, if not quite coincidence, than anything stronger. It is a true oratorio, too, with roots in a great tradition but, again, not overwhelmed by it. Narrative works on its own terms, rather than as that of an opera manqué. Franck Ollu conducted the excellent soloists (Wolfram Brandl, Yunna Shevchenko, Boris Bardenhagen, Nikolaus Janhjohr-Popa, Mathias Winkler, Frank-Immo Zichner) from the Staatskapelle Berlin. He seemed to me to do a very good job, sensitive to music, to drama, to the way the two combine and keep their distance (especially in a production such as this). But in a performance such as this, the element of chamber music is at least as important, and here the Berlin orchestra’s long tradition, aided and abetted by Daniel Barenboim, of subdivision into chamber ensembles, truly paid off. The singers impressed too, though perhaps a little more of Martin’s quasi-madrigalian intent might have been communicated at times. The intent was worlds away, of course, from today’s early-music world, but a hint or two of something akin to Nadia Boulanger’s singers – their Monteverdi still rules at least a certain roost – would have bound them together more closely. Anna Prohaska shone as Iseut, her voice revealing considerable deepness as well as purity of tone. Matthas Klink made for an ardent yet sensitive Tristan. Ludvig Lindström exhibited a degree of malevolence which, in terms of psychological realism, is perhaps more credible, certainly more usual, than that we associate with Wagner’s King Mark. Yet another feather, then, in the Staatsoper’s cap. Philipp Stölzl’s Deutsche Oper production of Parsifal replaced Gotz Friedrich’s offering from 1998 last season; I was able, in a feat of Wagnerian dedication unusual even for me, to see it revived just three days after Leipzig’s Good Friday staging of the Bühnenweihfestspiel. The opening might have made still stronger an impression on Good Friday: a depiction of what might be considered the work’s foundational myth, the Crucifixion, as the first-act Prelude offered musical and philosophical explanation as to why it might have been necessary – or, alternatively, why, in Michael Tanner’s analysis, following that of Robert Raphael, it might be necessary to stop Christ ascending the Cross. In a sense, Stölzl concurs; in a sense he does not. It might be necessary, but in the sorry consequences lain out, there is no chance of accomplishing such a need, whether symbolised by Parsifal or otherwise. What we see is one of the most accomplished and indeed extreme stagings I have yet witnessed from a school which, doubtless partially but not entirely unreasonably, understands Monsalvat as a religious community that has gone horribly, in this case irredeemably, wrong. In this Hell-on-Earth – is Hell not where Christ Himself sojourned before rising on Easter morning? – of religious fanaticism, lascivious, Opus Dei-tinged relish is taken in self-chastisement prior to continual re-enactment of deicide. Unable to look beyond the tableaux vivants which just about keep the community alive, its members re-present kitsch, yes, but deadly kitsch. Carl Dahlhaus's observation regarding the action's characterisation by 'inclination towards ritual and tableau' reveals, perhaps obsessively but certainly with conviction, a darker side indeed. Stölzl’s creation is not merely anti-Christian, more anti-religious, perhaps with respect both to organised religion and to transcendence. The Flowermaidens are initially more geological than blooming, seemingly hewn from the rock of Klingsor’s Tora Bora-like lair, before their brief moment of colour. Likewise, Kundry’s burqa-clad appearance – interestingly, quite unsensationalised – makes its point before her unveiling. All the while, the second act proceedings, perhaps an Orientalist ‘other’ to the sick ritualism of Monsalvat, are haunted by the sacrifice of a comely knight who has, perhaps tired of his moribund community, repeated Amfortas’s temptation and fall. Even when the would-be Crusader Parsifal is acclaimed, Resurrection never comes. At the moment of what would be healing, Amfortas impales himself upon the proffered spear: a way out, perhaps, but not that envisaged either by the Church or by Wagner. Perhaps Stölzl heeds John Deathridge’s warning of resolution in 'high-minded kitsch'. It is not how we should always wish to experience the work, and the redemption of redemption, above all in music, achieved by, Stefan Herheim is unavailable in a staging that pursues one concept single-mindedly rather than having them dialectically interact as Wagner himself did. There is room for both. Axel Kober led the fine Deutsche Oper Orchestra, which put not a foot wrong, in an honest, sensitive account, which, if it neither scaled the Boulezian dramatic heights nor plumbed the Gattian religious depths, told Wagner’s musical story well. Stefan Vinke’s proved untiring in the title role, though there were times when his vocal stridency proved a little too much. If the Knights had compared his tone with the warmth and humanity of Hans-Peter König’s Gurnemanz, they might have decided to enthrone the latter instead. Evelyn Herlitzius offered a duly committed performance as Kundry; her vocal wildness might have benefited from taming earlier in the second act, for there were undeniable passages of questionable intonation, but her wounded-animal reaction to Parsifal’s rejection offered a great musico-dramatic experience. Bo Skovhus’s detailed attention towards music, words, gesture, and their interaction was highly to be commended as Amfortas. Moreover, Tobias Kehrer made more of a mark than many as a deep-voiced Titurel. Knights, esquires, and Flowermaidens were of a consistently high standard, a credit to the company as a whole, likewise the truly excellent singing from William Spaulding’s chorus, its movement blocked with equal excellence. This was a Parsifal demanding both to be seen and to be heard. Perhaps one of the more surprising yet ultimately most significant revelations of Wagner Year for me was this Leipzig production of Die Feen and the conviction it furthered that Wagner’s first opera was not merely ‘interesting’, not merely ‘promising’, and so on, but a work which had been poorly, extremely unfairly treated by history – or rather by the lazy judgements of those claiming, and usually failing, to know the opera. Doubtless there will be exceptions – there are, after all, people who do not take to Parsifal – but I have yet to speak to anyone who has actually attended a performance of Die Feen who has not thought highly of it, if not necessarily quite so highly as I do. 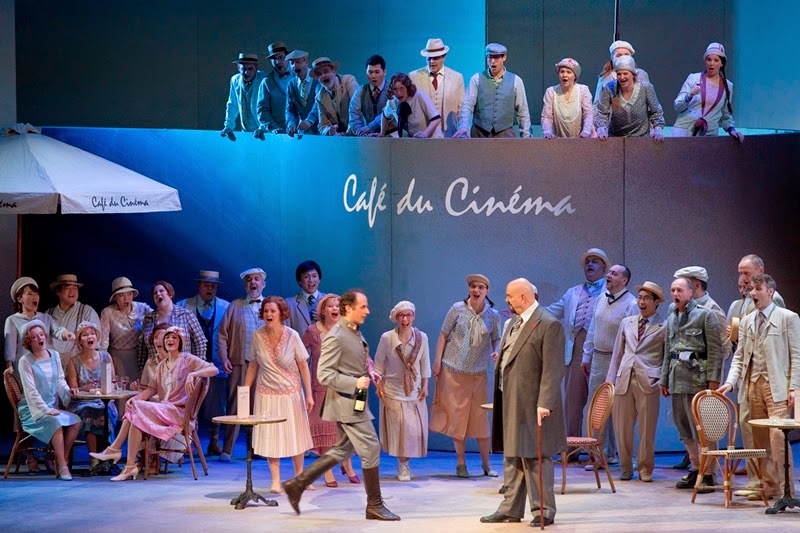 Uncannily, it was a year to the day – 20 April 2013 – when I heard that Leipzig performance as part of the first outing for Renaud Doucet’s delightful yet not unprobing staging. 20 April 2014 actually brought me to tears as the third act drew to a close, both delighted at the opportunity and saddened at the condescension or just downright ignorance with which this wonderful work still meets. So three cheers once again to Oper Leipzig. I shall not dwell on the staging, essentially because I have written about it before, along with some background both to the work and to other productions (click here), and the revival serves to confirm rather than to transform its qualities. On this basis, I should happily see more, metatheatricality worn lightly, humorously, yet tellingly. The metatheatricality, as I observed previously, is worn lightly yet wittily frames the performance – and reminds us, again lightly, that occasions such as this are few and far between. Following a Saturday evening family meal, a father tunes in to a live broadcast of Die Feen from Oper Leipzig. In something of a modern fairy-tale, his living room becomes the performance space, blurring of typical performing boundaries in a sense a counterpart to the blurring – yet ultimate upholding – of the world of immortality, the world of the fairies, to which, as Arindal, he, through the workings of his imagination, had exceptionally been admitted. In both cases, and above all through the medium of music – tellingly, in a clear echo of Orpheus and his lyre, that is how Wagner brings the story to reconciliation – this man, perhaps unremarkable and yet receptive and dedicated, brings different worlds together. It is not a bad model for artistic endeavour in more general terms: we all have our part to play, but the question is whether we shall be willing. Where Ulf Schirmer had tended more towards the early Romantic tendencies undoubtedly present in Wagner’s score – Mendelssohn, Marschner, Weber, and so on – Matthias Foremny seemed more concerned to place Wagner in the line he himself would later stress, if not necessarily for this work. Beethoven’s example stood more clearly than before: both the symphonic and the operatic composer. More than once I was put in mind of Wagner's early, underrated C major Symphony, but also of the advances he had made upon his work since then. Sometimes this worked better than others; there were occasions, for instance, when forward thrust was occasioned perhaps at the expense of ebb and flow. But for the most part, this was a valid, thought-provoking performance, which brought out something close to the best of the Leipzig Gewandhaus Orchestra. Its ‘old German’ glow seemed almost as much a welcome resurrection as that of the work itself, though in reality, of course, the former has never really gone away; it is more the case that one has to look, or listen, harder to find it in an age in which orchestral homogenisation is all too often the rule. Arnold Bezuyen once again impressed in the title role, not least in his portrayal of the difficult compromise between domesticity and the heroism that our paterfamilias imagines. There was some tiring towards the end of the third act, but Bezuyen recovered well. I had not encountered Elisabet Strid before, but she certainly impressed as Ada, a worthy successor to last year’s Christiane Libor. If only a woman in the centre stalls had not loudly coughed throughout the whole of Ada’s great second-act aria, so clearly inspired by Wilhelmine Schröder-Devrient (the aria, that is, rather than the coughing). Strid nevertheless rose above such selfish provocation to give a fine account of that extremely difficult number. Eun Yee You still seemed stretched as Lora, but had somewhat grown into the role. Mathias Hausmann offered a strong performance as Morald, whilst Paula Rummel and Milcho Borovinov delighted in their surprising buffo duet – and not just there. Though perhaps a little too much of a contrast for consistency to be maintained, it is a lovely piece and so it sounded here; the pair’s acting skills contributed as much as their musicality. The Leipzig Opera Chorus also made great contributions in both respects: their role here is often considerable, and gave no little pleasure on this occasion. I shall conclude by repeating my pleas both for this excellent production to be filmed, so that others may see – and hear – it, and for other houses to follow Leipzig’s suit. This is a work that has been wronged indeed; it is our responsibility finally to right that wrong. For reasons that remain unclear, Manon Lescaut seems recently to have become ubiquitous. 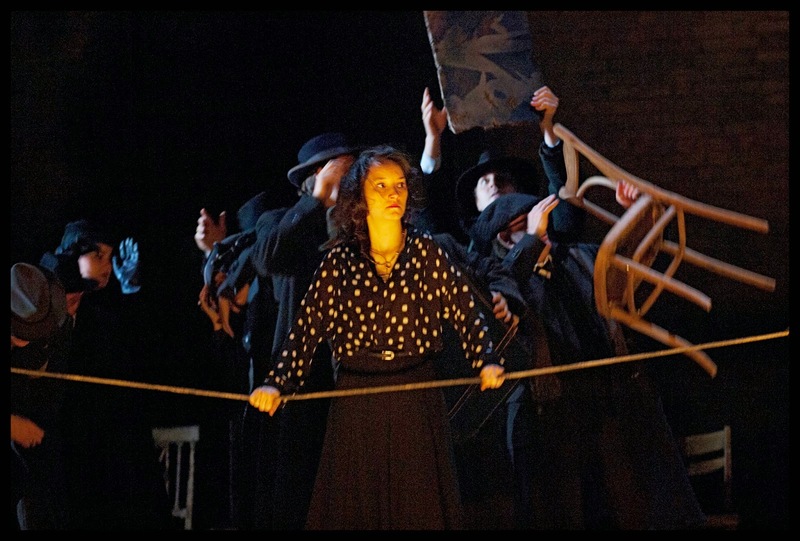 In the United Kingdom, both Welsh National Opera and the Royal Opera are offering new productions this season. Sir Simon Rattle has been leading the Berlin Philharmonic in this, his first Italian opera; Munich will soon be staging it; and so on, and so on. Doubtless the plans and availability of ‘star’ singers, not least Jonas Kaufmann, play a role, but that does not seem to be the whole story. A good few stagings of, for instance, La fanciulla del West, suggest that houses and audiences may be keen to hear Puccini works beyond the central triptych of Bohème, Tosca, and Madama Butterfly; maybe they are even tiring of those dangerously over-exposed works. 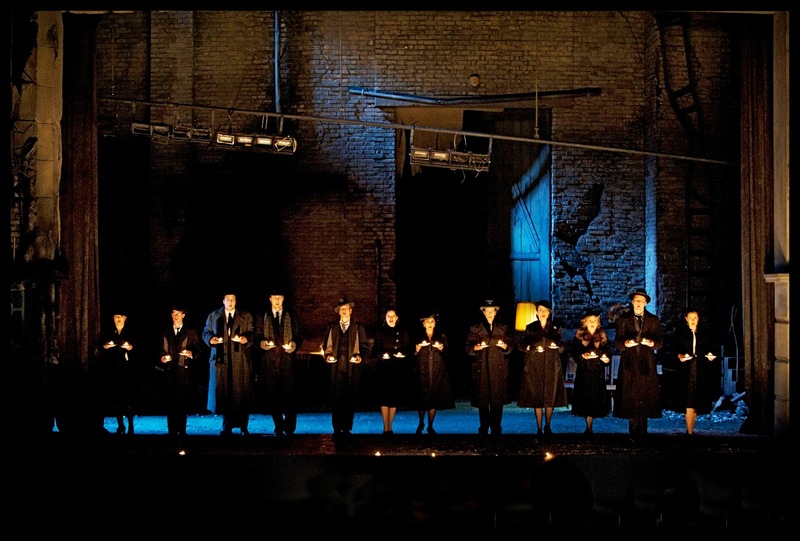 Leipzig got in a little earlier with this 2006 production by Giancarlo Monaco, conducted at its premiere by Riccardo Chailly, and now revived under Anthony Bramall. The version employed, the 1893 original version for Turin, as edited by Roger Parker for Ricordi, was Chailly’s choice. Though Puccini would continue to tinker, in particular long Manon’s fourth act aria, ‘Sola, perduta, abbandonata’, until reinstating it, slightly modified, for the thirtieth-anniversary performance at La Scala in 1923, the principal difference here concerns the first act finale. Before both the vocal score was published and the first La Scala performance (1894), Puccini followed Luigi Illica’s suggestion and wrote a different ending. Here we therefore heard what Mosco Carner, in his New Grove article on the opera, describes – justly – as a ‘conventional pezzo concertato, based on the melody of “Donna non vidi mai”’. 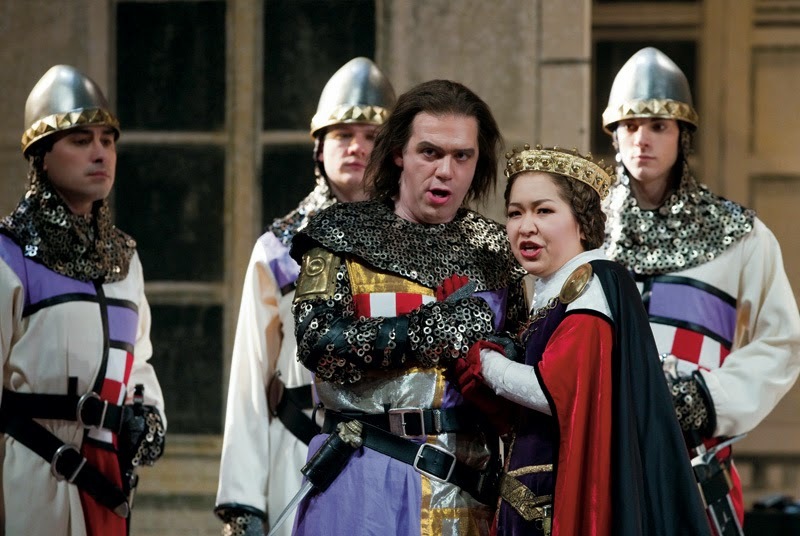 Chailly considered this original finale ‘more serious’, drawing Wagnerian comparisons. I wish I could hear them, for frankly, to my ears, the first act as a whole is ultimately rather dull, considerably less characteristic of the composer than the second act, let alone the much stronger third and fourth – which seem to me to have more of Wagner in them too. (Puccini had visited Bayreuth n 1889 and 1890.) Still, for those with ears to hear, this is clearly an interesting opportunity to hear Puccini’s first thoughts. The principal problem, however, was Nadja Michael’s assumption of the title role. As with other occasions I have heard her – Salome at Covent Garden, for instance – she seemed incapable of singing in tune. Vibrato of a variety that occludes distinctions between one or two degrees of the scale may or may not be overlooked. Persistently flat intonation, of a nature that had one wondering whether she was attempting ‘historically informed’ or maybe ‘deformed’ Puccini at Baroque pitch, is another matter again. Michael, as is her wont, threw herself enthusiastically into the role and exhibited undoubted stage presence, but musical considerations can hardly be cast aside here. That said, matters improved – somewhat, though far from entirely – in the third and fourth acts. Her gymnast’s bow during the curtain calls proved equally memorable. To his great credit, José Fardilha held his own with respect to intonation: no mean feat in duets. His was indeed a creditable performance throughout: typically Italianate in spirit, but fully in technical control. The other particularly impressive performance was James Moellenhoff’s Geronte, dark and deep of tone to an extent that suggested a Prince Gremin. Smaller roles were well taken, and choral singing was of a high quality throughout. The chorus moved well on stage too, its blocking adding distinction to Monaco’s attractive, if ultimately somewhat conventional production. Despite the updating to the 1920s and certain cinematic references, it was difficult to glean any particular insights. The madrigalists looked a little too much like refugees from an imitation Otto Schenk Rosenkavalier to convince for Paris. Still, Johannes Leiacker’s set designs and Birgit Wensch’s costumes retained their period lustre, and the starkness of the desert for the fourth act offered welcome contrast, also permitting one to focus more or less entirely on the plight of the doomed lovers. A silent film interlude, taken from Arthur Robinson’s 1926 Manon Lescaut, opened the second act; it did not, however, fill in the gap in the action, that is, when the lovers live together, but rather foretold what was to come. Perhaps surprisingly, no such footage was used during the Intermezzo. It was a little difficult to understand why.